(AP) KADUNA, Nigeria - Aid workers searched for bodies Monday among charred vehicles and destroyed market stalls after a trio of church bombings sparked reprisal killings in northern Nigeria, officials said. The Nigerian Red Cross said the death toll had more than doubled, to 50 people. A radical Islamist sect on Monday claimed responsibility for Sunday's suicide attacks at two churches in the city of Zaria and another in the city of Kaduna that left 21 people dead, according to an initial count. The reprisals highlight festering religious tensions in Nigeria, a nation of more than 160 million people. The attacks occurred in the religious flashpoint state of Kaduna that sits at the border between the country's predominantly Muslim north and its mainly Christian south. A history of attacks and counterattacks between the two communities means that authorities are often cautious about releasing death figures. Officials initially said 21 people were killed in Sunday morning's blasts. But the Nigerian Red Cross said late Sunday that the death toll had jumped to 50, to include reprisal killings. Officials refused to give a breakdown clarifying who died in the initial blasts and who was killed in reprisals. "We did that for a reason," said Andronicus Adeyemo, deputy head of disaster management at the Nigerian Red Cross. "Those figures are sensitive." Amid the aftermath of those attacks, police say men armed with bombs and guns have launched attacks in a city in a separate part of northeast Nigeria where a radical Islamist sect had killed scores of people last year. It was not immediately clear what parts of Damaturu were attacked beginning at about 5 p.m. Monday, or whether there were any casualties, said Yobe state police chief Patrick Egbuniwe. It was also not clear who was attacking whom. But Egbuniwe said "terrorists are trying to show that they can't be stopped." But he also said the violence appeared to be calming down. In November, the radical Islamist sect known as Boko Haram claimed responsibility for bombings and shootings in Damaturu, including some at Christian churches, which left more than 100 people dead in and around the city. Authorities fear that a breakdown of the deaths from Sunday's attacks will trigger revenge killings. Most of the victims killed in church on Sunday are presumed to be Christian and most of those killed in reprisal attacks are presumed to be Muslim, raising concerns that a distinction between initial and reprisal deaths will be interpreted as a Christian and Muslim breakdown. 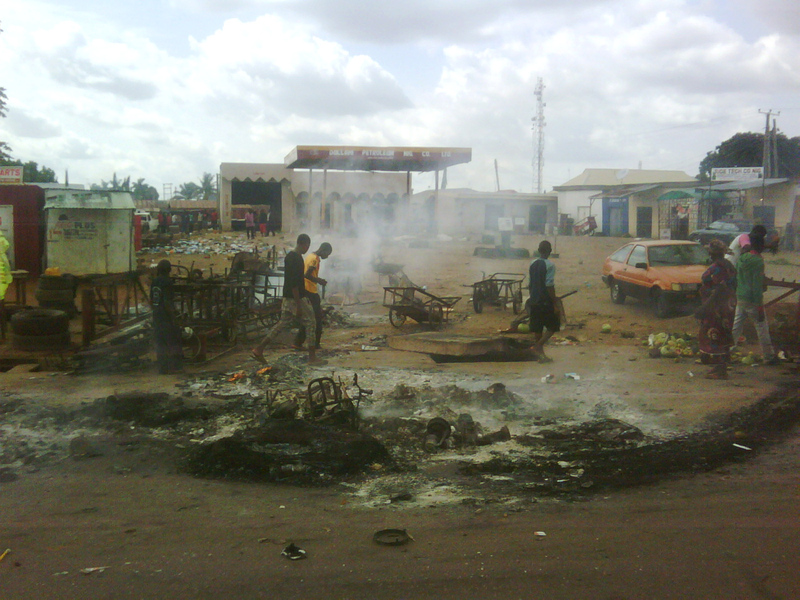 In Kaduna, relief officials said they were still collecting bodies on Monday. Most victims were petty traders and transporters such as bus drivers and motorcycle taxi drivers, who are presumed to be Muslim and who commute daily to the predominantly Christian southern part of the city. An Associated Press reporter saw charred motorcycles, buses and stalls that littered deserted streets in predominantly Christian neighborhoods Monday. The state government initially imposed a 24-hour curfew, but relaxed it Monday to a dusk-until-dawn curfew. "We are still picking up bodies from reprisals," Musa Illalah, the National Emergency Management Agency coordinator for Kaduna State, said Monday morning. The group known as Boko Haram said in an email that it was responsible for the attacks. "Allah has given us victory in the attacks we launched (Sunday) against churches in Kaduna and Zaria towns which resulted in the deaths of many Christians and security personnel," the statement said in the local Hausa language. Boko Haram, whose name means "Western education is sacrilege" in Hausa, is waging an increasingly bloody fight with Nigeria's security agencies and public. More than 580 people have been killed in violence blamed on the sect this year alone, according to an AP count. As news of the church attack filtered through the city Sunday morning, young Christians took to the streets in violent protest. An AP reporter saw billows of smoke over a mosque in a predominantly Christian part of the city. People had mounted illegal roadblocks and were seen harassing motorists. A motorcycle rider in that same neighborhood lay seriously hurt and bleeding by the road side. Motorbike riders often become easy targets during reprisal attacks by Christians. Police said that about 1,000 Muslims took refuge at police quarters. The first two suicide bomb attacks occurred Sunday within about 10 minutes of each other in different part of the city of Zaria. Thirty minutes later, a third attack targeting a church rocked the nearby city of Kaduna. All three attacks wounded at least 100 people, an official who works with a relief agency involved in rescue efforts had said Sunday. He spoke on condition of anonymity because he wasn't authorized to speak to journalists. Churches have been increasingly targeted by violence in Nigeria. This is the third weekend in a row that Boko Haram is claiming responsibility for church attacks in central and northern Nigeria. Statements attributed to the group said they were responsible for church attacks in the first and second Sundays of June that killed at least 21 people. That threat has prompted churches to boost their security. Police said security guards stationed outside the three churches had kept the number of deaths relatively low. "In most of the attacks, they (the attackers) did not reach their desired location," national police spokesman Frank Mba told Nigeria's state-run television. The most deadly attacks seem to have targeted Christian holidays: An Easter Day blast in Kaduna left at least 38 people dead, and a Christmas Day suicide bombing of a Catholic church near Nigeria's capital killed at least 44. Boko Haram claimed responsibility for both attacks.